I have been saving some of our favorite rock-related links and ideas from this unit to post… but quite honestly, I have not wanted to do it yet because we’ve been doing more academic workbook stuff lately than fun hands-on activities (shame on me). I’m working on getting out of my workbook rut and back into a KONOS hands-on fun routine. I go in spurts with getting to the fun stuff. I blame part of it on the fact that we’ve moved around so much since we began our school-year this year… from house to hotel to relatives’ houses to apartment (from one state to another)… and with our new schedule changes (Tuesday and Wednesdays for weekends instead of Saturday/Sunday due to Daddy’s work schedule), and me having to adjust from eating out every meal to cooking every meal… I’ve been having a hard time getting our permanent routine to STICK. Kids really need routine. I think we adults need it almost as badly. So, with that in mind… I’m giving myself the go-ahead and writing this “ROCK POST” to inspire myself as much as I want it to inspire you. I need to get busy and finish this unit with a “BANG!” – since we are a bit behind schedule on our lesson plan calendar this year (understandably)… and we are eager to move on to Planets/Seasons/Solar System next! This post will be especially helpful to those of you studying about Texas and Arkansas Rocks… since we have plenty of both and tons of links about them! Below are some great links that I have gathered while doing planning and research for this unit. HOLY COW, there’s a lot of neat stuff on Enchanted Learning! Learned that there’s a beryl named after my daughter – “Morganite”! Igneous Rocks are Created by Volcanic Action! 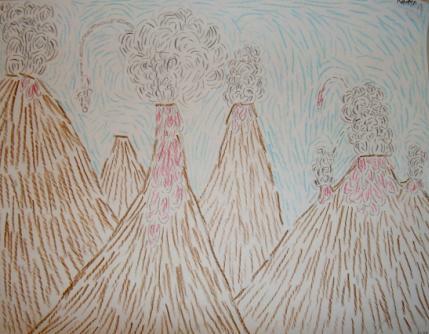 Here’s Kaden’s (age 9) Volcano Artwork which is as priceless as Van Goh to me! He really loves volcanoes, and could have stayed on this unit all year. Finish our Rock Lapbook (that is turning out to be more of a scrapbook/notebook) and post a photo of it in this post! We have pyrite (fools gold), shale, sandstone, granite, limestone, flint, shale, quartz and calcite (amber colored – from Texas). We also have a few rocks we haven’t identified yet. Kaden has a piece of pumace (volcanic rock full of holes and very light) from the pocket of his “stone-washed” jeans which is his treasured possession as well (pumace is the only rock that “floats”). Here in Arkansas, there is a ton of sandstone and shale, which is where we got most of those types. 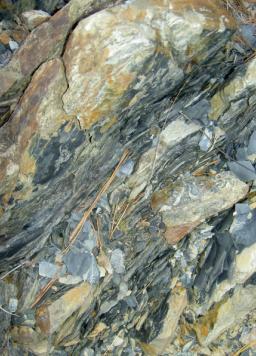 When shale is heated and pressurized the sedimentary rocks becomes a metamorphic rock called slate. It is so awesome to find slate layers in a mostly sandstone and shale hill… some of the slices of slate are as thin as paper and black as night (see photo below). The crystals we found yesterday at the Crystal mine in Hot Springs (tons of them) are covered with an orange chemical (iron) that must be removed to make the crystals white and clear. We’re working on meeting up with a geologist to learn about this. I have a phone number of someone locally. Maybe we can go do it at HIS lab instead of at home. I’ll come back at a later date and post the rocks and minerals we have received through the mail on this post as well. Of course, we also have “exotic” bags of rocks which have been polished from rock stores… many different colors, shapes, and sizes. Mommy even has a Brazilian Amethyst and a Garnet that I keep for Kaden and Morgan (birthstones). I miss our things in storage even more now, because Kaden and Morgan have a rock tumbler in a box somewhere in Texas which really would come in handy right now! Texas is covered with a lot of limestone, but they also have petrified wood, iron ore, halite, aluminum, marble, sulfur and many other rocks. The Austin hill country is formed by beautiful rugged white limestone hills covered with cedars, twisted oaks, cactus and yucca plants. There are lots of ocean fossils from when the flood covered the earth in the hills surrounding Austin. We found lots of huge spiral shells that were completely fossilized and petrified rock animals when we went on a field trip to search for rocks there! There are also rock clam shells and pretty amber calcite crystals we have from that area. In the central farmlands, there is an abundance of iron ore and petrified wood. My son even has an arrow head from this area. Near the gulf coast there is black gumbo clay and on the beach, you can find seashells. I have heard of halite mines there and wanted to go to visit one, but we have not done that yet. We took a trip to Hot Springs yesterday to dig crystals out of the ground. I’ll have to post a separate post about our field trip and include some photographs later. It was really fun. The great thing about this unit is that the knowledge we gain will go with us forever… because it is one of our favorite things to do (collecting rocks) and we plan to continue it into the future. I can’t wait to get the rest of our rocks in the mail from those who promised to send them. I’m expecting rocks from Ohio, Florida, Washington State, Tennessee, etc. We’ll have fun mapping them together and seeing lots of interesting rocks we may have not seen before! This post updated on 2/14/06. Thanks for your help, your so sweet. Well, it makes sense, Spiritbee…honey, I take it it’s related some how. I’m going to attempt the blogroll, wish me luck. It’s funny you are doing the Rock unit study. Is it the one from Vol.1? We just got back from NC and the whole time we were there, the children were fasinated with the rocks, so when we go back in March I was planning on doing a rock unit study…what a kawinkydink. Anyways., thanks for the links and the books, it’s going to be VERY helpful when I do it. I took pics of our trip in the mountains if you want to stop by and see. It is the first time I have ever really been high up in the mountains like that. We did a cake experiment while we were there, it was fun and good-2 BONUSES of homeschooling! I’d bee happy to email you some recipes. Do you perfer meals or desserts or both? BTW, I’m not Armenian, my DH is. I’m Italian and some other stuff all mixed up, I guess you could call me a mutt-LOL! We had such a blast digging with you guys yesterday! Ben has been soaking and scrubbing the rocks we brought home, all morning! I left Hot Springs so inspired to really get going with Konos in full force. Ben kept asking me yesterday, “when are we going to school today?”, because I told him we were going to be going on a HS field trip. Since this was his first field trip, he didn’t know that he WAS hs’ing and having lots of fun doing it! He really enjoyed meeting Morgan and Kadeon also! We are looking forward to our next get together and meeting other Konos folks from the area! I just thought of something, I don’t know how far exactly you are from Springfield, MO, but my mom has a honey store there and it might be fun for you all to go. It’s called Honey Heaven. Amber – 🙂 Awww, shucks. I’m glad you’ll be using our rockish links. Nice to know that someone is gaining something from my “notes”. I use them to keep records, keep myself accountable, and keep my wits about me. I’m quite sure that without constant thinking, my brain might turn to mush. Children have that effect on you! I did stop in and look at your mountains. I love mountains. I used to visit Seattle as a kid and loved flying in to the airport there with the peaks of mountains in the clouds, covered with pretty white snow! Looking forward to those recipes. I am a mutt also… Russian, English, Cherokee, Polish, German, Canadian, … so I guess that makes me a Texan. 😉 My husband is 1/2 Czech, 1/2 Texan. We like Tex-Czech food as well as Middle Eastern (and everything else). Sara – Yes, the field trip was wonderful. It’s nice when you are learning without any effort, eh? Now if all these little nicks and cuts in my hands would heal, I’d be just fine! Some of those crystals were sharp! In Texas, we used to call those volcanic stones pumice… not that we had any volcanoes to speak of. 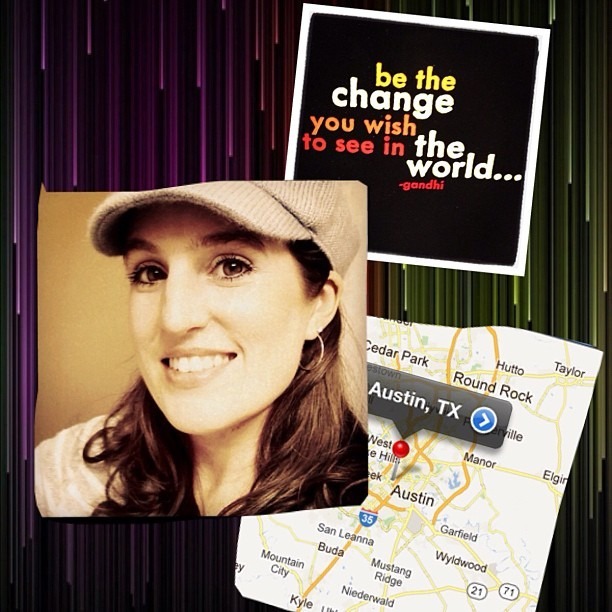 Happened upon this valuable post as I was searching for Rocks & Minerals lesson plans. Thanks! Found some good stuff here. It was certainly interesting for me to read the blog. Thanx for it. I like such themes and everything that is connected to this matter. I would like to read more on that blog soon.